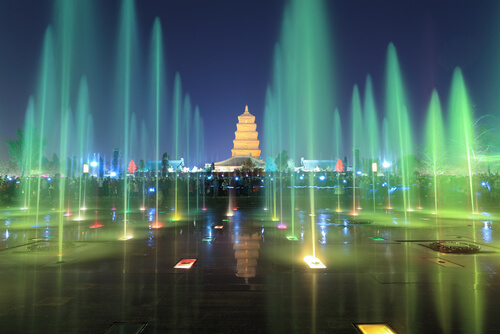 The city of Xi’an is widely considered to be one of the four most significant capitals of the ancient world. Much like its international counterparts in Athens, Cairo and Rome, Xi’an has played a significant role throughout history. It was the capital city of 13 different imperial dynasties, welcomed many famous historical figures and was the starting point of the Silk Road. Due to its central location on the southern bank of the Wei River, Xi’an provided the perfect location for people across Asia to congregate and trade. Stroll through the cosmopolitan streets of Xi’an and you’ll witness a masterful synthesis of ancient past and modern present. Roads lined with contemporary high-rises are interspersed with traditional bucket-arch temples and thriving gardens. Generally speaking, the city is split into eight different districts, each with its own atmosphere and attractions. 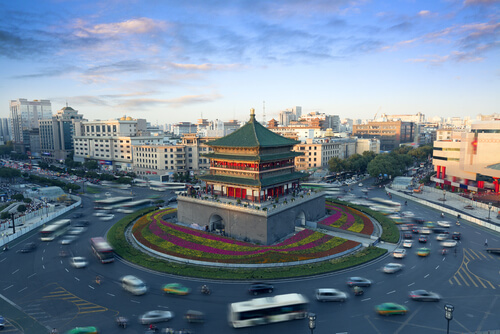 The Chang’an and Xincheng areas are home to some of the city’s best landmarks and temples, while the Muslim quarter is home to 10 Chinese-style mosques and a sizeable Islamic population. For a glimpse into the quaint China you’ve seen in books, visit one of the city’s many parks at dawn to witness elderly residents practicing their morning taiji (tai chi) ritual. Under the Tang empire, the city was a major religious hub and many structures were built to welcome worshippers of various faiths from across the country. Dayan ta (Giant Wild Goose Pagoda) is one example. Built for the study of Buddhist scripture in the 7th century, the pagoda remains an important site to this day. While the outside of the building is fairly plain, the inside features statues and ceiling beams laden in gold, with elaborately decorated panels lining the walls. For stellar views of the Xi’an skyline, climb to the top and take it all in. The pagoda’s grandiosity can be attributed to master Xuanzang, a renowned monk who bought relics to Xi’an, via the Silk Road, from his travels through India. These items can still be viewed today. Originally, the pagoda had five storeys and was 60m high, however, because of decay and earthquakes, it has been drastically renovated several times. The current iteration – now a popular tourist attraction – is seven storeys high and has the largest musical fountain in the country. Another popular site in Xi’an is the ancient city wall, built during the Ming dynasty. It stands at 12 m and stretches almost 14 km, surrounding the old town. As with many ancient cities, the wall was built as a form of military defence but unlike its counterparts, Xi’an’s wall still stands. No visit to Xi’an is complete without paying a visit to the Bing Ma Yong (Army of Terracotta Warriors). Built as part of the first emperor of Qin’s elaborate mausoleum, the terracotta army is comprised of thousands of clay soldiers, chariots, horses and weapons. To date over 2,000 soldiers and other figures have been uncovered, but the site is still active and archeologists continue to work on the excavation of significant parts of the complex to this day.